Recently, I've been sharing a few competitions with you all, as the festive period creeps upon us, it's a good time of year to try and win some prizes! Prizes come in all shapes and sizes, you can win books, you can win chocolate, you can win toys and games, you can win vouchers and cash, you can win hampers and phones, and then you can win a Jaguar E Type Driving Experience thanks to U Drive Cars! Worth £99, why not enter the competition to give yourself or a loved one, a Jaguar E Type driving experience!? Running until December 11th, there is plenty of time to enter, and with 13 ways to enter, you're really not stuck for choice! You'll get to drive this style icon for 6 laps in the car that made Enzo Ferrari say that it was the most beautiful car he never designed! The car is the winner of the most recent beautiful car of all time competition, in Autocar Magazine, not only does it look sensational, but it sounds amazing too and it goes like the wind with 265BHP and 150MP, they're truly fantastic cars! Why not enter the driving experience competition for your chance to win this luxury and unique prize!? I know quite a few people who would love to win this driving experience, it would be a fantastic Christmas present, a wonderful birthday gift and the best anniversary present to receive! Enter the competition via the Rafflecopter form below, or enter the competition on the U Drive Cars website! Driver must hold a full manual driving licence and must be at least 17 years of age. The experience is valid until the 30/09/16 and the experience must be booked and take place before this date. Events run on selected Fridays and Saturdays until September 2016. We recommend booking early to avoid disappointment. 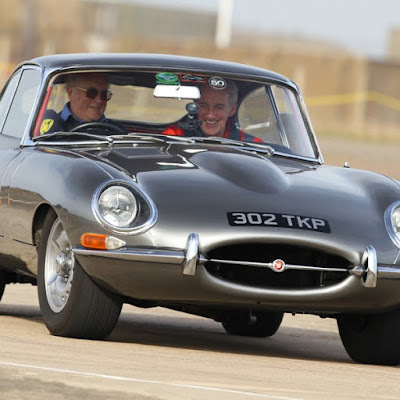 The Jaguar E Type Experience is a 6 Lap drive around our course with a commemorative certificate on completion. Children, friends and family are welcome to spectate at no extra charge. Time of booking is subject to availability. This competition is not open to U Drive Cars employees.